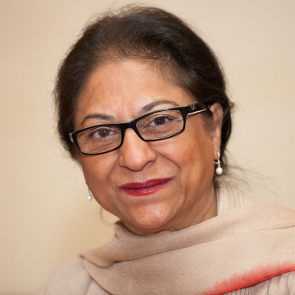 Front Line Defenders expresses its profound sorrow at the passing of Pakistani lawyer and human rights defender Asma Jahangir. A pioneer and leader of the human rights movement in her country, Asma ascended the international stage, becoming a pillar of the global human rights movement and a leading light for the defence of human rights in Pakistan. Never one to shy away from a struggle, Asma defended extremely difficult cases and challenged those in power who committed human rights abuses. Virtually since her first day as an activist and human rights defender, working to advance women’s rights, children’s rights and the rights of minorities, she has been at risk, both of arrest for challenging the authorities in Pakistan and of physical harm having received countless death threats. Asma was one of the founders and served as Chairperson of the Human Rights Commission of Pakistan (HRCP), and subsequently was selected as UN Special Rapporteur on Extrajudicial, Summary, or Arbitrary Executions from 1998 to 2004 and as Special Rapporteur on Freedom of Religion and Belief from 2004 to mid-2010. Front Line Defenders relied on Asma and her sister, Hina Jilani, who serves on the Front Line Defenders International Board of Advisors, for guidance and insight into the situation of HRDs in Pakistan and the region. In 1995, Asma was named as the winner of the Martin Ennals Award. Front Line Defenders offers its deepest condolences to Hina and Asma’s entire family and colleagues. The light of the human rights movement is a little less bright at this moment of Asma’s passing. lasts longest, whatever ever renews. she would seek out the sun, and fight it. Poem by Kyla Pasha, Published in Daily Times, February 13th 2018.